A brief respite from beading and work and tonight I headed off to an event put on by the London Cocktail Society. This was at the lovely Graphic Bar (which I had visited recently for one of their Juniper Society events). This evening was based around a blind gin-tasting to see which was the true favourite without any visual clues etc. We tasted 5 gins in all and I was immediately able to identify the first one, my favourite, Hendricks, but after that it was all down hill. 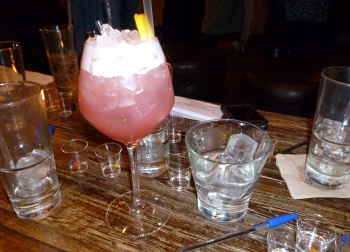 As the evening wore on, and more were tasted, it soon became apparent that our tastebuds weren't up to the job and one we may have hated at first taste became loved on a second taste and vice-versa. Pretty soon they all blended into one and making choices became harder. But dedicated people that we are we persevered! I have no idea what was voted the favourite or if I managed to identify more than one out of the five as by then the time was getting on and more and more neat gin had been consumed. I ordered a Rhubarb Daisy (Bourbon, Chase Rhubarb Liqueur, Fresh Lemon Juice, Grenadine & Rhubarb Bitters) to finish the night before heading home, stopping for a meal in our favourite Hk Diner on the way to counteract some of the alcohol!